Colour prentin teepically uises ink o fower colours: cyan, magenta, yellae an key (black). When CMY “primaries” are combined at full strenth, the resultin “secondary” mixtures are reid, green an blue. Mixin aw three gies black. 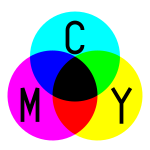 The CMYK colour model (process colour, fower colour) is a subtractive colour model, uised in colour prentin, an is an aa uised tae describe the prentin process itsel. This page wis last eeditit on 14 Februar 2018, at 03:49.